Cadillac Culinary Challenge - This Weekend! 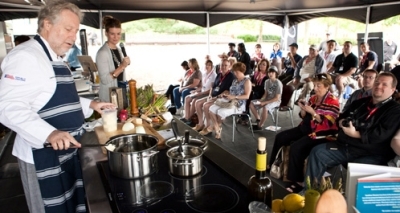 The Cadillac Culinary Challenge is being held this weekend at Legacy Village. Come by and watch the competition between Chef Jonathan Waxman of Barbuto and local Chef Marlin Kaplan of Dragonfly as they cook against each other to see who can come up with the best creation after being given a set of ingredients. I've been asked to participate as one of the judges at one of the event times. Marlin Kaplan is the local Chef that is taking part in the competition- you can watch a video profile of him at www.youtube.com/watch and watch him cook up a great looking pork dish at www.youtube.com/watch. Hope to see you at Legacy Village this weekend!